Semaphore, a cloud platform for testing and releasing software from last week has free public accounts for testing open source and a freemium model for private projects, whereby they will create an open platform for software testing and delivery, similar to what GitHub does for source code. This team is bootstrapped from Serbia since 2011 and are punching above their weight with global customers such as 500px, General Assembly and Dribbble. A solution for both open source and commercial projects with business-friendly features is currently not available on the market, where VC-backed companies like CircleCI and CodeShip are also competing. Our mission is to provide top service for software testing and integration and free accounts for open source projects are a logic next step. We believe that thorugh providing people with the best way to develop their software we are gaining as well. When Semaphore was created the key was to simplify this kind of tool and now is the moment for it to become more accessible. That is why we decided to enable free Semaphore use for private projects in smaller scale and to remove the limit in the number of projects for every plan. Together with some previous changes, Semaphore is slowly becoming continuous integration service which can be used for all kinds of projects and can serve ever bigger part of the market. Free accounts have two processors available, which allows them to either test two private projects or branches at the same time, or run one build with tests split in two parallel threads. As Marko tells us, Semaphore would not be possible without Git, Linux, PhantomJS and other open source projects and tools and this is their way of giving back to this community. 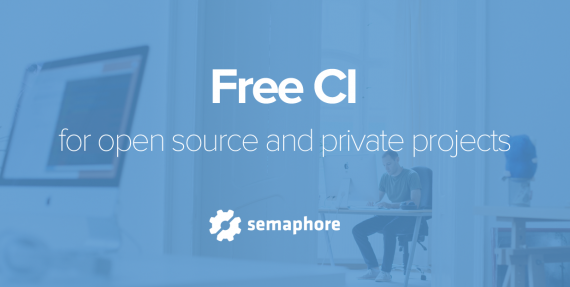 Our goal has always been to make Semaphore free for open source projects. However bootstrapping from an almost anonymous position obliged us to wait until the business is profitable enough. All we had was a team and a goal to keep making the best continuous integration service we can. Now we are happy to share it with the community. All current users and organizations running open source projects on Semaphore have now public profiles, such as Perceptive Software or FlatStack. Also, they have now an additional plan – Starter which costs $29 and allows you to test unlimited number of private projects. If you want to find out more about these changes, we suggest you to visit their blog.